Kunsthandel Inez Stodel cordially invites you to our Fall Exhibition. We will show our latest acquisitions and artworks by Philip Sajet for the occasion of OPEN! 2010 in the Spiegelkwartier in Amsterdam. In 1977 – when the first snow fell – Philip Sajet first decided to make jewellery. Nine years later he had his first solo exhibition and now his work is shown at Kunsthandel Inez Stodel for Sajet’s 39th solo exhibition. At our special request Philip has made many of his most famous jewels, such as the Palette Necklace and the Harlequin Ring. Philip Sajet was born in 1953 in Amsterdam. His father was Dutch, but his mother, whose father was a jeweller in Paris, came from France. A few years ago Sajet and his wife moved to the South of France, where they are both goldsmith. Sajet has his own vision of his craft “Jewels are small objects that you wear on the skin, cheer you up, adorn us and to show our necessary vanity”. In his clearly defined area of rings, necklaces and earrings Sajet shows us his groundbreaking designs. Sajet is honored that his work is shown in a jewellery loving environment for the first time. 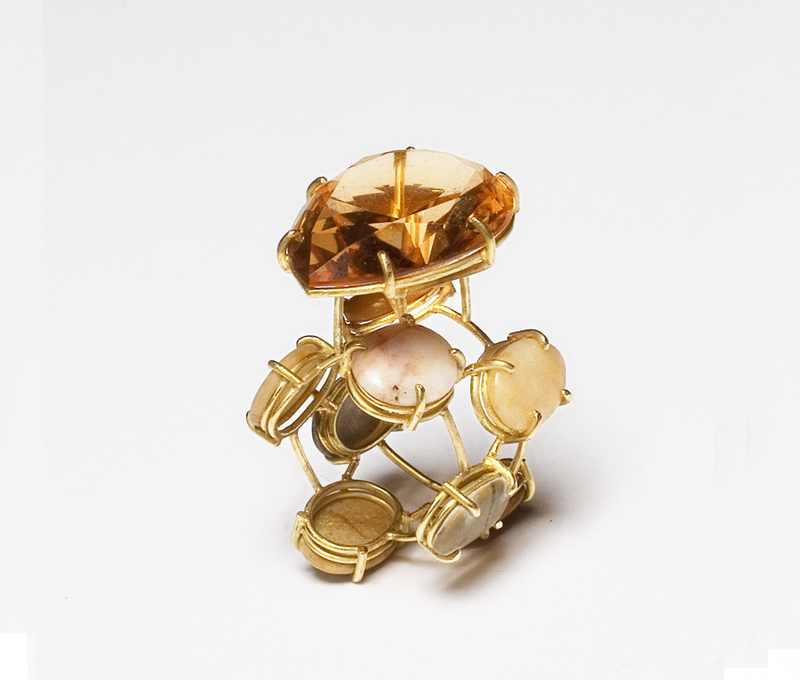 We have chosen Philip Sajet because his jewels are works of art that show a lot of craftsmanship, love and humour. They are contemporary but go back to the basis of the art of jewellery. You will see large minerals, glass and pearls with a lot of colored enamel. The shape of diamonds often returns in different guises. For us there are many surprises, not only in Sajet’s view of his craft but also in how he gives this expression. In 2011, the CODA Museum in Apeldoorn will stage a Sajet retrospective. The Moon of Baroda by Philip Sajet is an 18 carat gold ring, set with seven cabochon flints and a pear cut citrine of circa 24 carats. Sajet was inspired by the pear shaped canary yellow diamond from India with the same name. The original Moon of Baroda of 24.04 carats was owned by the Maharajas of Baroda for 500 years before it was bought by Meyer Rosenbaum, director of Meyer Jewellery Company, in 1920. 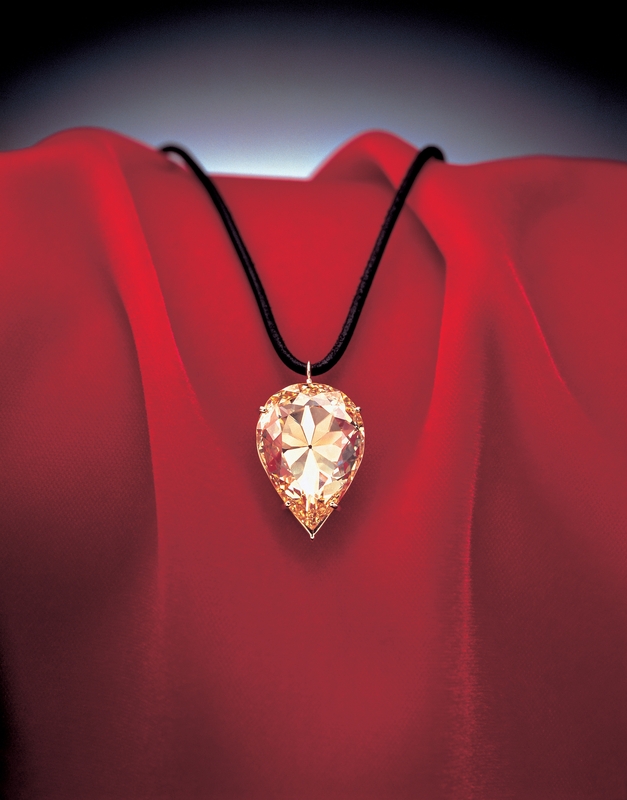 The diamond was borrowed to the most extraordinary Hollywood movie star of all times, Marilyn Monroe for her performance of Diamonds are a girl’s best friend in the legendary movie Gentlemen prefer blondes. In real life Marilyn did not own real diamonds. This entry was posted in Contemporary Design, Diamonds and tagged Diamonds, Diamonds are a girl's best friend, Kunsthandel Inez Stodel, Marilyn Monroe, Moon of Baroda, Philip Sajet. Bookmark the permalink.